We provide convenient ways for development, debugging, and unit tests to improve your development experience. Here, we need to use egg-bin module (Only used in local development and unit tests. For production environment, please refer to Deployment). Once we have modified code and saved in local development, the app will restart automatically, and our changes will take place right after that. And then we may start app by npm run dev. To start app in local, environment needs to be set as env: local. The configuration comes from the combination of both config.local.js and config.default.js. "dev": "egg-bin dev --port 7001"
Here we mainly cover the usage of the tools, for more details about unit tests, please refer to here. And then we can run unit test by npm test. To run test cases, environment needs to be set as env: unittest. The configuration comes from the combination of both config.local.js and config.unittest.js. npm test command will look for all the files ended with .test.js under test folder (default glob matching rule is test/**/*.test.js). glob expressions are supported here. Mocha supports various reporters. Default reporter is spec. Besides environment variables, egg-bin test also supports passing parameters directly, and it supports all mocha parameters. You may refer to mocha usage. 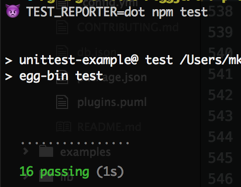 $ # Equivalent to `TESTS=test/**/test.js npm test`. Since the limitation of bash, it's better to add double qoute to path. $ # Parameters of mocha are supported, such as grep, require, etc. $ npm test -- -t 30000 --grep="should GET"
egg-bin has build-in nyc to support calculating code coverage report of unit test. And then we can get code coverage report of unit test via npm run cov. And we may open HTML file of complete code coverage report via open coverage/lcov-report/index.html. Just like test, the environment needs to be set to env:unittest to run cov, and the configuration comes from the combination of both config.local.js and config.unittest.js. There's a built-in Log in the egg, so you may use logger.debug() to print out debug information. We recommend you use it in your own code. Levels of logs can be configured via config.logger.level for printing into file, and config.logger.consoleLevel for printing into console. debug module is a debug tool widely adopted in Node.js community, plenty of modules are using it to print debug information. So for the Egg community. We recommand you use it in your own development of framework and plugins. It's easy for us to watch the whole process of test through DEBUG as the environment variable to start with certain code. Detail logs of unit tests progress are able to be viewed via DEBUG=* npm test. And then we may set breakpoints for debugging our app via npm run debug. egg-bin will select debug protocol automatically. Inspector Protocol will be selected for version 8.x and later. For earlier ones, Legacy Protocol is the choice. Meanwhile, It also supports customized debug parameters. Debug port of master is 9229 or 5858 (Legacy Protocol). Debug port of agent is fixed to 5800, it is customizable via process.env.EGG_AGENT_DEBUG_PORT. Debug port number of worker will increase from master port number. During developing period, worker will "hot restart" once the code is changed, and it will cause the increase of port. Please refer to the following IDE configuration for auto-reconnecting. App starts by env: local when executing debug . The configuration comes from the combination of both config.local.js and config.unittest.js. The latest DevTools only supports Inspector Protocol. Thus you will need to install Node.js 8.x or higher verions to be able to use it. Debug Proxy online, now you could attach to 9999 without worry about reload. Visit the DevTools URL printed in the last few lines in console directly. Since this URL is proxied from worker, you don't need to worry about restarting. 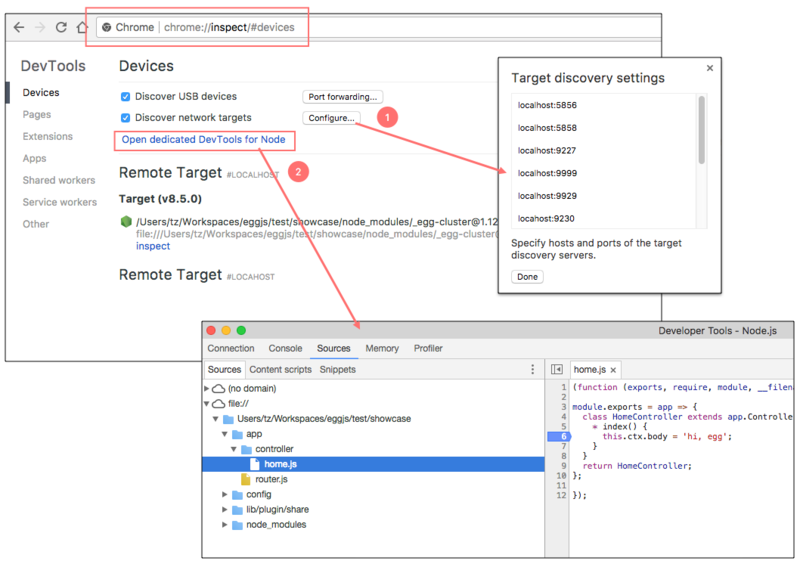 Open chrome://inspect, and config port accordingly, then click Open dedicated DevTools for Node to open debug console. egg-bin will read environment variable $NODE_DEBUG_OPTION set in WebStorm debug mode. 1st method: open settings in VSCode, turn on Debug: Toggle Auto Attach, and then execute npm run debug in the terminal. 2nd method: setup .vscode/launch.json in VSCode, and then simply start with F5 key. (Note: You have to turn off the settings mentioned in the 1st method before doing it). And we offer a vscode-eggjs extention to setup auto-matically. 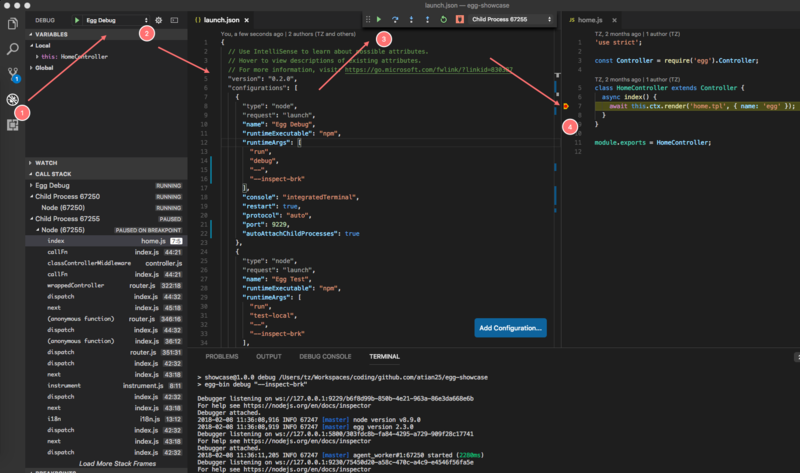 For more options of setting up debug in VSCode, please refer to Node.js Debugging in VS Code. If you would like to know more about local development, like customizing a local development tool for your team, please refer to egg-bin.